A credible insider has leaked details about Destiny's next DLC expansion called "Rise of Iron". Due for release in September 2016, the next expansion will fill the gap between Destiny's original game and the launch of the sequel that's due for release in 2017. After the recent free update in April, this larger DLC will be more like the expansion we saw with The Taken King, notably containing multiple PvE story missions, strikes and most importantly a new Raid activity that we've all come to love. With that of course comes a higher price, in the range of $30 - $40. So what do we actually know so far? Well, the actual source of the leak has provided two major elements of the new expansion: it's name and possibly more interestingly an official poster image. A larger version of the poster image is shown below and it's certainly worth discussing the possibilities for this expansion based on this. 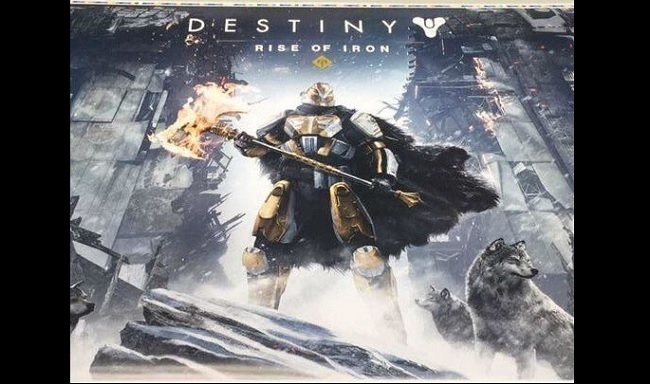 It's not perfectly clear how this expansion is related to Iron Banner, but there's an uncanny resemblance to Iron Banner's maestro "Lord Saladin" who's brandishing a hammer (or axe) in the poster. He's standing in front of what appears to be Earth's Cosmodrome wall which could imply he's responsible for its defence and protection. We know that Lord Saladin represents the Iron Banner and led the defense at Twilight Gap. He's a "hero to the City and a legend in his own right", according to the games Grimoire. There are several Iron Lords who we know by the names of IB weapons:. Jolder, Skorri, Felwinter, Timur, etc. In the Grimoire they're depicted as ancient warriors who were there to defend the City when it was founded. We could assume that they are all dead now, and Saladin remains to honor them. How does this relate to the expansion titled Rise of Iron? 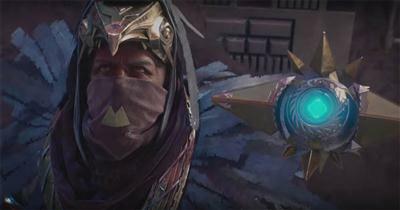 I would speculate that we have Saladin as our primary quest-giver who charges us Guardian's with defending the city. Further Grimoire states that the Iron Wolves were a group of Guardians who, like the Iron Lords, came to the Last City's defense during one its darkest hours. We know little about the Iron Wolves or their relation to the Iron Lords, except that the Wolves gathered beneath an Ironwood tree and swore an unbreakable oath. The Iron Banner tournament is held in honor of both the Iron Lords and the Iron Wolves. Two additional Bungie sources have confirmed the authenticity of the poster above and hinted that the expansion will revolve around a Fallen theme rather than the Cabal race that we had believed would be the final DLC for Destiny 1. The supposed reason for this is because the raid content is loosely based on cut content from last year's House of Wolves DLC, which we know turned into the Prison of Elders arena activity. Cabal content moved to Destiny 2? Since the beginning of Destiny, the community stumbled upon areas in Destiny that weren't supposed to be accessible. Mission areas and strikes were just two the game's "cut content" that later became expansion and DLC content in the following months. There were several high level departures during the run up to Destiny's release which we all know led to the downfall in Bungie's usually rich storytelling element. It appears that history is repeating itself once again: for better or worse. The Cabal content that we thought we'd receive in Destiny's final expansion has now been cut and "reserved" for Destiny 2. Considering the amount of investment in Destiny already, I wouldn't be surprised if the Cabal content becomes Destiny 2's default Raid and main theme. E3 is due to start in mid June and it's certainly likely that Rise of Iron will be officially revealed to the community then. My guess is that the Playstation event on the Wednesday evening would be the suitable time and date for this especially considering the partnership that Destiny has with Playstation. No doubt many of Destiny's popular YouTuber's have already been invited to play the expansion and will be revealing their own inside information and gameplay videos once the official Bungie reveal has been made. Current speculation suggests that a September release date is inevitable. This would tie up with the games original release window and The Taken King expansion the following year.